One of the most complicated and confusing aspects to a home staging business is the associated home staging costs involved. There are fees for training. Then there are fees to be earned for providing a staging service. As a result, questions regarding home staging fees and costs are some of our most frequently asked questions. In the training we provide, we cover this subject thoroughly at Decorate-Redecorate and should our trainees have any further questions on the subject, we provide free on-going mentoring services. At Decorate-Redecorate you can find everything you need to become a home staging professional from a variety of courses, top-notch informative books, slideshows, powerpoint presentations with scripts and even promotional post cards. These wonderful, affordable tools aren’t just for novices either nor for those who take our courses, but since we offer them for sale a la carte, many stagers from other programs purchase these items as well to help them grow their business. 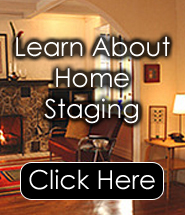 You'll find there are a wide variety of ways that stagers figure out their home staging costs. Each trainee will be guided in how to decipher for themselves the best way to price out their services, as well as how to factor in their own training costs and fees so they can figure their net profit margins. How much a stager can make for services rendered will be different depending on where you live, the scope of the project and competition in their area. But regardless of where you live, there is a dire need for these types of services and a professional who does good work will find they can make a comfortable living in the industry. Home staging costs are minimal for training when compared with the average costs associated with starting a business. The decorating and restaging business is waiting for you to start turning plain, ordinary homes into showplaces. So if you love to decorate, you owe it to yourself to take that innate talent and turn it into profit.